Do you wish your skin was clearer and smoother? Whether you’ve always had moles or lesions, or if they’ve recently appeared, these imperfections can cause you to be extremely self-conscious. the elite cosmetic surgery center is one of the Best Cosmetic Mole Removal, Lesion, & Birthmark Removal center in Nashik. What Are the Skin Conditions that Cause Trouble? Should I Be Worried About Cancer? Many times if someone has excessive quantity Moles on your body this is one symptom of skin Cancer. So ignoring it will be dangerous for your health. Moles or cysts could metastasize and spread to other areas of the body which are the signs of skin cancer. Skin growths could be a definite cause for concern If they’ve appeared recently. Some moles removed before they become a bigger problem they are classified as “pre-cancerous”. We all want a gorgeous skin that glows, that’s healthy and that is happy! Elite cosmetic surgery center gives you the best services for both kinds of skin blemishes such as cancerous and non-cancerous Cosmetic surgery is a remedy. without leaving behind a visible scar, surgery can remove the blemish. 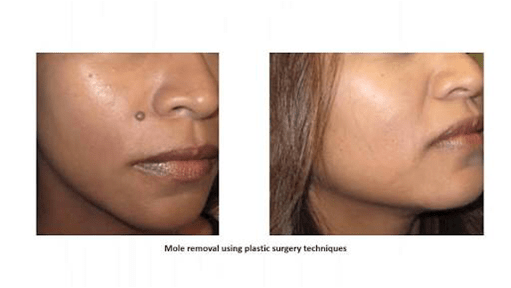 Be sure to find a high-quality reputable plastic surgeon because It takes expertise and knowledge to perform a mole removal that hides or minimizes a scar. 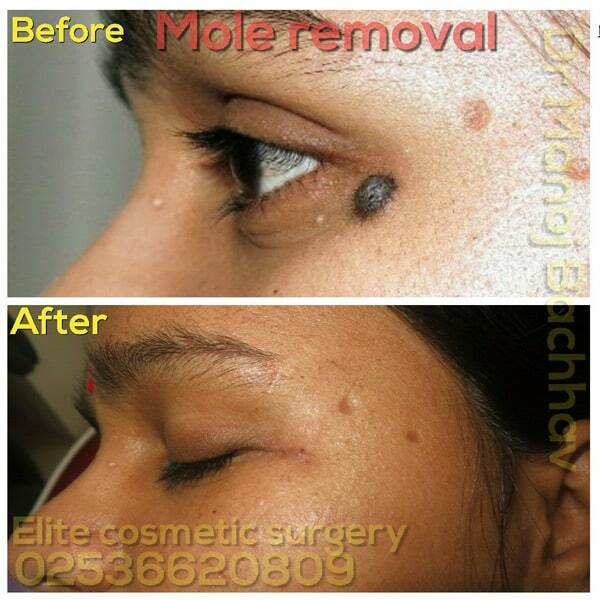 Dr.Bachhav’ elite cosmetic surgery center provides Best Mole Removal Treatments in Nashik. To perform a variety of procedures we use the radiofrequency (RF) radiosurgery. RF ablative technique is used extensively to remove benign naevi (moles).To shape and flatten the mole During the procedure A radiofrequency instrument is then used, the mole is anesthetized with the local anesthetic. To shape and flatten the mole A radiofrequency instrument is used. There is no bleeding because Blood vessels are sealed in the process. The result is visible immediately. After taking treatment in elite cosmetic surgery center Result will be achieved usually within 2-3 months there is typically some degree of redness which fades over time. So if you wanted to remove Mole, Lesion or birthmark from your skin Visit today to elite cosmetic surgery center provides the best plastic surgery treatments at an affordable cost. To Experience the New Technologies Treatments in Nashik, Visit Elite Cosmetic Surgery Center for Best Mole-Birthmark Removal Treatment in Nashik.